Home > Steam Theory > What is Steam? Steam is the gas formed when water passes from the liquid to the gaseous state. At the molecular level, this is when H2O molecules manage to break free from the bonds (i.e. hydrogen bonds) keeping them together. In liquid water, H2O molecules are constantly being joined together and separated. As the water molecules are heated, however, the bonds connecting the molecules start breaking more rapidly than they can form. Eventually, when enough heat is supplied, some molecules will break free. These 'free' molecules form the transparent gas we know as steam, or more specifically dry steam. In steam-using industries, two commonly referred to types of steam are dry steam (also called ”saturated steam”) and wet steam. Dry steam applies to steam when all its water molecules remain in the gaseous state. It's a transparent gas. Wet steam applies to steam when a portion of its water molecules have given up their energy (latent heat) and condense to form tiny water droplets. Take the example of a kettle boiling water. Water is first heated using an element. As water absorbs more and more heat from the element, its molecules become more agitated and it starts to boil. Once enough energy is absorbed, part of the water vaporizes, which can represent an increase as much as 1600X in molecular volume. Sometimes a mist can be seen coming out of the spout. This mist is an example of how dry steam, when released into the colder atmosphere, loses some of its energy by transferring it to the ambient air. If enough energy is lost that intermolecular bonds start forming again, tiny airborne droplets can be seen. This mixture of water in the liquid state (tiny droplets) and gaseous state (steam) is called wet steam. Steam played a vital role in the industrial revolution. The modernization of the steam engine in the early 18th century led to major breakthroughs such as the invention of the steam locomotive and the steamboat, not to mention the steam furnace and the steam hammer. The latter is not a reference to water hammer found in steam piping, but rather to a steam-powered hammer used to shape forgings. Nowadays, however, internal combustion engines and electricity have often replaced steam as a power source. Even so, steam is still being widely used in electrical power plants and for some large scale industrial applications. Steam is now mostly known for its heating applications, as both a source of direct and indirect heat. The direct steam heating method refers to processes where steam is in direct contact with the product being heated. The example below shows Chinese dumplings being steamed. A steaming basket is placed over a pot of boiling water. As the water boils, steam rises into the basket and cooks the food. In this setup, the boiler (pot) and steaming vessel (basket) are combined together. The principle behind steaming food is that by allowing steam to come in direct contact with the product being heated, the latent heat of steam can be directly transferred to the food, and the water droplets formed through condensation can supply moisture. In industry, the direct steam heating method is often used for cooking, sterilization, steam smothering, vulcanization and other processes. The indirect steam heating method refers to processes where steam is not in direct contact with the product being heated. It is widely used in industry because it provides rapid, even heating. This method often uses a heat exchanger to heat the product. The advantage of this method over direct steam heating is that the water droplets formed during heating will not affect the product. 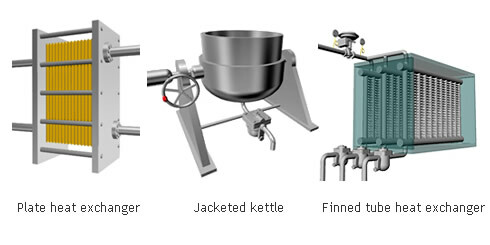 Steam can therefore be used in a variety of applications such as for melting, drying, boiling and the like. Indirect steam heating is used in a wide range of processes such as those for the production of foods and beverages, tires, paper, cardboard, fuels such as gasoline and medicine to name a few.